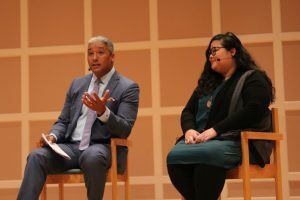 The second day of the Truth and Transformation: Changing Racial Narratives in the Media conference featured a panel discussion on how change in racial narratives can be implemented in newsrooms. 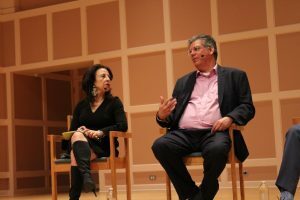 After starting the day on Wednesday, March 20, with a keynote from award-winning journalist and president and CEO of the Futuro Media Group, Maria Hinojosa, she was joined on stage by three other noteworthy media professionals who also implement narrative change within their respective organizations. 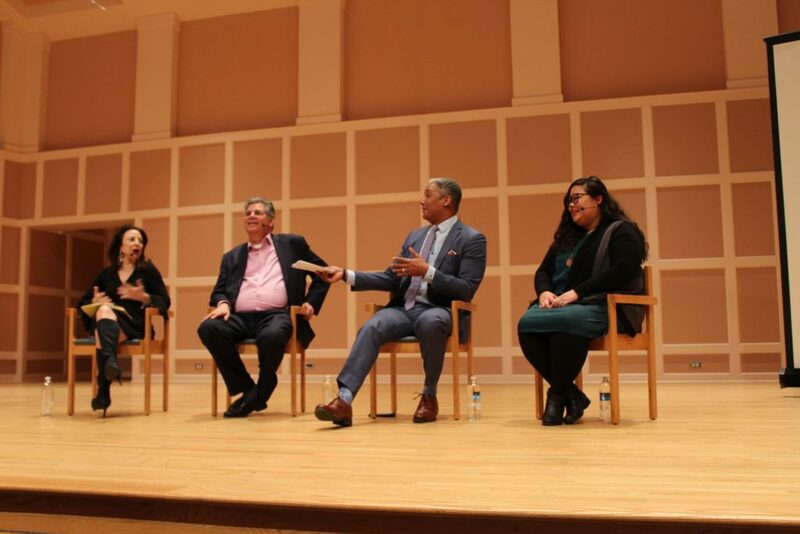 Panelists (left to right) Maria Hinojosa, Mark Trahant, Steve Wyche and Emma Carew Grovum offered local newsrooms opportunities to improve diversity and coverage. The discussion was facilitated by Minnesota Public Radio News host Angela Davis and recorded for broadcast, and it aired this week if you would like to listen to the panel conversation. Davis was joined by ThreeSixty alumna and multiplatform storyteller and media diversity advocate Emma Carew Grovum, who works in New York. Grovum got her start in Twin Cities media at the Star Tribune, and she now works with newsrooms to promote diversity. Another Minnesota-native on the panel was NFL Network Senior Reporter Steve Wyche. Wyche broke the story about San Francisco 49ers star quarterback Colin Kaepernick taking a knee during the national anthem. The final panelist was Indian Country Today Editor Mark Trahant. He left mainstream media to work for Indian Country Today and highlighted the importance of telling stories in a unique way. He described how most of the readers access the stories on a mobile device, and he shared what it’s like to meet people who tell him how for the first time, the news matters to them. The key to the success? Patience. He and Hinojosa agree this approach of sensitivity and investment in their audiences is paying off with growing readership. Panelists drew on their own experiences and also answered audience questions regarding how to improve racial narratives in media. Their suggestions for the audience members included action items, which newsrooms could implement after leaving the conference. We have included the answers to two key questions about what can be done. Journalists often reduce people of color to stereotypes or completely ignore them…What do you think is behind that perception, and what can we do better? Mark Trahant: This country cannot be the country it wants to be unless it understands the complexity of this work. Every attempt that it’s tried for over two centuries has failed. It’s an ongoing issue that’s going to be sorted out by generations to come. One of the things that gives me great solace is that my Shoshone community has a 10,000-year history in this world…and when you think about that in the context of what’s going on today, change has been a part of this North American experience for a very long time. And, the American part of that story is a tiny slice of it. It’s that larger story that needs to get out, is this long tale rather than just this quick chapter. Steve Wyche: We’re in this vacuum… to get people to invest their time, to understand these stories, to understand why people feel ignored. Even today, when we’re talking about immigration. We’re talking about some of the racist issues going on… That’s an easy story for a journalist to do. Let’s go to the original peoples of this country, and let’s see how they feel about immigration. Have you seen it? That’s a lay-up! Let’s go to the indigenous peoples and see their take on immigration. It’s not hard, but the decision makers and the people that can say something to the decision makers have yet to ask the question or push the envelope. It’s not hard. But as people want their paycheck or keep their job, sometimes they don’t push hard enough. Again, there’s so many news platforms…there’s so many different ways you can tell stories. Content is the big buzzword in what we do in the world today. If you go fish in the water, there’s a good chance that fish might bite. Emma Carew Grovum: I think that, you know, it really comes down to the decision-makers, and it’s hard work. It’s difficult to do this kind of work, and it takes an investment. It takes time. It takes resources. You know, I was a local news reporter… and I can’t imagine doing that job today. It is hard. You guys are out there holding the house up… filing two to three stories a day, and you’re tweeting about it, and you’re working with photographers, you’re working with videographers. And so when are you supposed to sit down and think really quickly about how is the story being received by the audience? How is the story being perceived by the community that you’re reporting on? I really think that that has to do with the editors and the news directors who are saying, you know, take a step back. Are we telling authentic stories? Are we telling stories that make sense for our community? If we’re not, how can we get better? How can we build that relationship? How can we meet our community where they are and say, “Let’s build this relationship. Let’s tell each other stories.” It really is an investment, and I think that the first step is having all of you here today. This is a wonderful turnout, I’m so thrilled to see this many people here. Maria Hinojosa: Part of the thing is that, if you think about what just happened in our industry, and I’m talking about journalism, when we have several stories about men who were sexually harassing, assaulting, fill-in the word, in our own buildings. In some cases, leading the coverage. If we use that as a way to understand. They were reporting about sexual abuse and assault, and they, themselves were perpetrators. There’s a moment, in a way, where we can use that as a teaching experience…If we could somehow use that analogy to have people understand their coverage of women, people of color or immigrants in general. It’s really hard to look at yourself from afar, but that’s what we need them to do so that they’re in touch with themselves. We all carry our own biases, right? I mean, I told Steve when I first sat down: “Dude, I don’t know anything about sports.” You know, what if I had said to him, for example: “Dude, I don’t know any black people, but if I make a mistake, just understand.” Do you understand? What if we could say: “I’m not really sure about this territory, but I’m showing you humility. I’m showing you that I’m not really sure, so would you correct me and work with me?” What about that kind of humility are we even seeing right now in newsrooms? Steve Wyche: It’s your job to ask questions, figure it out. You know, you’re scared to ask questions because you may be scared to offend. I’m a native of Minneapolis, lived in St. Louis when I was in elementary school and I was one of the few black kids…and people would ask me stupid questions all the time…Now I look back, and they just didn’t know. I think, as journalists now, if we ask questions of things we don’t understand and try not to offend. At the same time, that’s a way to kind of build a bridge to tell a story more honestly. I think, as journalists, sometimes we’re afraid. We want to take the quick and easy way out because of deadlines, because of the constant churning of information. We don’t report the depth and breadth that we use when we tell stories honestly. Angela Davis: I think I want to answer the question, also. I think what I’ve seen in newsrooms I’ve worked in, not just in Minnesota but around the country, it’s hard to tell the stories of people of color when you don’t have any people of color in the newsroom…There is also that deadline pressure. There’s a tendency to go to sources that are reliable, quick, easy and accessible so you can talk and meet your deadline. What’s easy. What’s easy is often not what’s most effective… A big part of it is having relationships outside your own circle. What is some practical advice you can give to journalists in the room? Emma Carew Grovum: Get your data and tell your data story. Look at the audience sometime, like what’s your time on the site for people of color? Really build that data story and make the case to your editors that this is an audience that matters, this is an audience that has value. Maybe you want to convert them to membership or you want them to buy a subscription, well the first step is to build that trust… The first step is to do that storytelling… learn about your metrics and learn about what kind of impact your journalism is having. Steve Wyche: I think part of it, too, is pitching your story…don’t just go in there with an idea, you have to go through the process of how you’re gonna get the story, how you’re gonna get the information. When you go to pitch a story now…you have to have every base covered. Mark Trahant: We’re a very small operation, and we’re always looking for ways to defy gravity. I think that creativity goes a long way. Maria Hinojosa: You have got to have some data. Remember, that’s why these conversations are really important for us to learn how to talk about the data in terms of powerful audience members…Also understand the way we talk about our numbers has to change…Learn how we can talk about this data, so we can understand that we, as consumers of media, also have power in that business conversation.